Posted June 20, 2013 by Rory & filed under Uncategorized. Hello, and welcome to It’s About Performance, a blog at the cross roads of performance development and performance support. 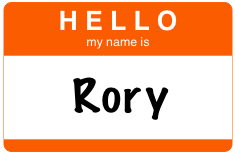 My name is Rory (if you didn’t notice the name tag), and I’ll be focusing on both of those topics here. In my day job, my role has a dual focus – supporting colleagues as they develop and enhance their skills (performance development), and supporting them as they perform their day-to-day tasks on-the-job (performance support). To give a little something back to the community that I have learned for for all these years. To learn even more from the community. I’ll be writing about my experiences, challenging myself and the community to think differently about performance development and performance support, and generally trying to get better every day. I’ve still got some cleanup to do here and there around the site, so please excuse the dust and hammering from time to time. Thanks for stopping by, please join in the conversation. GREAT blog and great work Rory!! Anxious to follow along… You will be a tremendous resources and have done amazing work in this area… THANKS for starting this up! Thanks Bob. I’m excited to try my hand at blogging.